Otaki College and Friends of the Otaki River have joined forces to plant 1100 native trees on Arbor day, Friday 5th June. These are the same trees the college students helped pot from seedlings last spring. “And now they see the success of their native nurturing,” FOTOR Chairman Max Lutz said. A mulched planting site has been prepared along Chrystall’s Bend Walkway and the pre-dug holes will be ready for the young trees. ‘We are very grateful to Westpac Bank for contributing $5000 to this project, which unites environmental education and river enhancement in one package’ Join the college students and Friends of the Otaki River for this community effort. Planting commences at 10am at the Walkway. 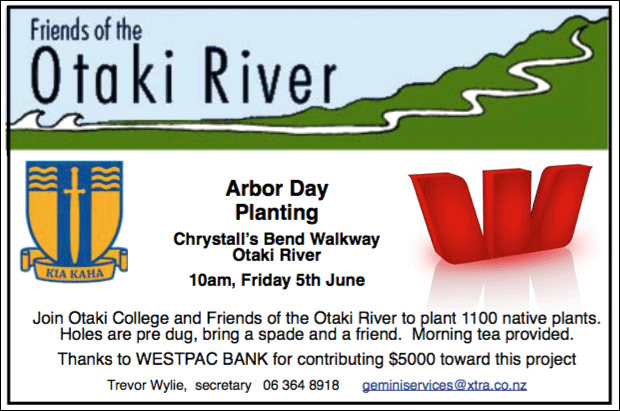 Join Otaki College and Friends of the Otaki River to plant 1100 native plants. Holes are pre dug, bring a spade and a friend. Morning tea provided.